Both Mayor Rahm Emanuel and police Superintendent Garry McCarthy blame weak gun laws for recurring violence in Chicago. Chicago has made national headlines this week for the latest sad and mind-boggling murder of a child. Police say that 14-year-old Endia Martin was shot and killed Monday on her porch in the Back of the Yards neighborhood by another 14-year-old upset at her over a boy. The shooter acquired the gun from her uncle, who bought it illegally. 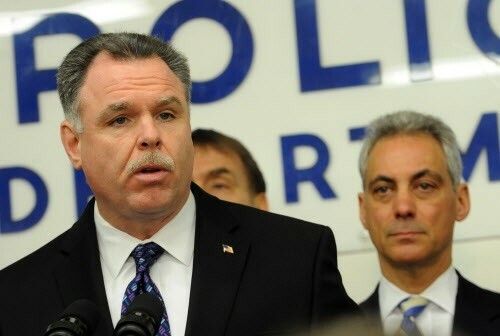 An angry police Superintendent Garry McCarthy blamed the incident on weak gun laws. "This is madness," he told reporters. "What would have been, under any other circumstances, probably a fistfight between two 14-year-old girls because of an argument over a boy turned into a murder." The cycle of tragedy and blame is probably starting to seem familiar to anyone who's lived in this city for more than a year. Research—and common sense—has revealed that the causes of urban violence are complex: a toxic mix of, among other things, joblessness, poverty, segregation, struggling schools, stress and mental illness, shifting gang alliances, the illegal drug trade, and environments in which power and relevance are demanded with guns. None of it is easy to address. But when the public clamors for immediate answers, officials step to the bully pulpit and provide them, hoping to shift the pressure elsewhere at the very least. The cycle continues. But don't take my word for it. Here's a look at how city leaders have responded to some of the most notorious outbreaks of violence since Chicago's bloodiest year, 1992. 1992: Over Labor Day weekend 28 people are slain and 79 others shot. Superintendent Matt Rodriguez candidly tells reporters that stopping the bloodshed will take more than aggressive policing. "We'd like to get more proactive and try to be preventive in terms of doing some research into the causes," he says. Then seven-year-old Dantrell Davis is murdered by a sniper in October. Some officials call for deploying the National Guard, but Mayor Richard M. Daley shuts down the idea, saying the real solutions are clear. "It shows you the proliferation of guns in our society and drugs in our society," he says. The year ends with 943 homicides, the second-highest murder total, and highest murder rate, in Chicago history. 1998: Fourteen-year-old Delvon Harris and 15-year-old Robert Owens are shot and killed on February 2 in Back of the Yards. A 12-year-old is charged with the murders. Daley calls on gun manufacturers and sellers to be held liable for crimes committed with their products, while Republican Governor George Ryan proposes his own crackdown, including life sentences for some gun crimes. 2003: In April seven-year-old Ashley Poole is shot in the stomach while eating candy on her front porch in West Englewood. Less than a week later, 12-year-old Rene Guillen is murdered after participating in a neighborhood cleanup event in Back of the Yards. Daley declares a war on gangs and guns and says he'll move more police to high-crime areas. In August seven-year-old Ana Mateo is caught in the crossfire and killed during a shooting in Pilsen. Chicago finishes the year with 600 murders, tops in the country for the second year in a row. 2006: On March 3, 14-year-old Starkesia Reed is slain by a stray bullet in Englewood. On March 11, ten-year-old Siretha White is killed by another stray bullet in the same neighborhood. Daley and Governor Rod Blagojevich call for a ban on assault weapons. "These are the weapons of mass destruction and all you have to do is come to Englewood to understand that," the governor says. 2008: Ruben Ivy, 18, is shot and killed soon after leaving Crane High School on March 7. Daley calls for tougher gun laws, while police chief Jody Weis says he'll move more police from desk jobs to the street. The violence only gets worse, with at least 36 people shot and seven murdered during a warm weekend in April. Daley urges citizens to take responsibility for their communities. "I want the parents on the block to say, 'This block will be free of violence,'" he says. In July the Taste of Chicago is marred by a shooting, and in August another hail of bullets wounds two men, one fatally, outside the iconic Rock 'n' Roll McDonald's. 2010: After several outbursts of violence in April, state reps John Fritchey and La Shawn Ford call for help from the National Guard. Daley dismisses the idea. On May 19 police officer Thomas Wortham IV is murdered in front of his parents' home in Chatham. Daley blames gun manufacturers. "They're bigger than the oil industry, bigger than the gas industry, bigger than Google, bigger than President Obama and the rest of them," he says. In August, eight-year-old Tanaja Stokes is shot and killed while skipping rope. Daley says he'll move more officers from desk to street duty. 2012: On January 19, following a frigid day, Mayor Rahm Emanuel issues a press release noting that the city has gone a full day without a single shooting or gun crime. But over an unseasonably warm St. Patrick's Day weekend, ten people are killed and 40 others shot. One of the fatalities is six-year-old Aliyah Shell, who was slain while playing in front of her home in Little Village. Emanuel blames gangs. Superintendent McCarthy says police are developing a more sophisticated gang-intelligence strategy. In June he announces that officers will be paid overtime to work extra shifts in high-violence areas. Chicago finishes the year with 503 murders, tops in the nation. 2013: On an unusually warm January 29, three people are killed before midafternoon, including 15-year-old Hadiya Pendleton, an honor student who had performed with her school band at the presidential inauguration a week earlier. Emanuel and McCarthy say they'll move more cops from desk duty to the street and call for tougher sentences for gun crimes. "Increasing these penalties and requiring minimum sentences will ensure criminals are held accountable and discourage criminals from carrying and using guns," the mayor says. On March 11 Jonylah Watkins, age six, is shot and killed while sitting on her father's lap in a car in Woodlawn. 2014: After at least nine people are killed and more than 40 others shot over Easter weekend, Emanuel calls for better parenting. McCarthy blames the state legislature—and the black caucus in particular—for not imposing stiffer sentences on gun offenders. "The gun violence in this city is the result of lax gun laws, period," McCarthy says on WGN-TV. Less than a week later, Endia Martin is shot and killed.